The year is 1909 and fifteen year-old Rhiannon Hughes and her young stepsister find themselves abandoned and alone. They are forced to leave their colliery cottage in the Welsh valleys and take refuge with Rhiannon's aunt, Florence Desmond, a popular music hall star. Rhiannon is instantly dazzled by this glamorous, exciting new world, and by the handsome young master of ceremonies, Gus Davenport. But Mair's feckless mother, Nellie, unexpectedly returns and lures Mair into Cardiff's sleazy underworld. 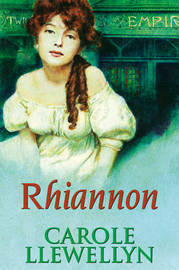 Rhiannon is torn between making a career in the theatre and keeping her promise to Mair, who needs her now more than ever. As for Gus Davenport, who has a reputation as a womaniser, will he prove to be a friend or an enemy? Carole Llewellyn was born in Bridgend, South Wales and previously worked in PR and in the theatre before becoming a successful businesswoman. She has written a variety of short stories for national magazines and newspapers including The Daily Telegraph and Woman's Weekly and is now a full-time writer. Her previous novel, Megan, was also published by Robert Hale.